Handsome Sterling Silver Cufflinks featuring a bull and bear design are available from Kitco. Even if you are not a financial specialist, nothing says Wall Street like this elegant pair of sterling silver bull and bear cufflinks. Representing strength and perseverance, this bull and bear cufflink set is hand-made and polished, made entirely of high grade 925 sterling silver. Each set comes in a stylish presentation box. Meticulously crafted in Germany, these sterling silver cufflinks are an ideal gift for Dad. Buy them for the market watcher, the business executive, and anyone who is looking for unique and exceptional silver cufflinks. The terms "bull" and "bear" have been used to describe market conditions for hundreds of years. An upward trend is described as a bull market, while downward movement is considered a bear market. These sterling silver bull and bear cufflinks are symbols of powerful market forces. They will make an excellent retirement gift for men, or as a gift for a work anniversary, Father's Day or as a celebratory gift to mark a milestone in business. 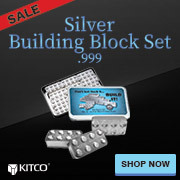 Buy Sterling Silver Cufflinks Bull and Bear from Kitco today. Why buy Silver Cuff Links from Kitco? Kitco is the trusted leader in the silver bullion and physical precious metals industry. Silver bullion and other physical precious metals sold by Kitco are recognized in bullion markets around the world. With our focus on silver bullion, you can benefit from our low silver bullion prices and premiums that are highly competitive in the industry. At Kitco, we make it easy for you to manage your wealth. You can sell or buy silver bullion and other unique physical precious metal items using our convenient online store, or by contacting our team of highly trained precious metals specialists. Backed by our global information network, Kitco has proudly been serving our customers since 1977.